Last week I did a short piece for the Guardian about the lack of an open map of England's green belt. This morning CPRE published a map and short briefing about the green belt being under threat (extract below). 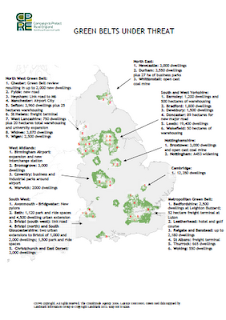 There is a national PDF map and a more detailed briefing about particular examples but there is still no way to zoom in to local areas to see it in more detail. The map also cites the source of the data - not the government - so that's why it can't be open and shared. I think this is a bad situation but I've said that already. I just can't believe that such an important national dataset is not in the public domain. Rant over. Nice work from CPRE though. 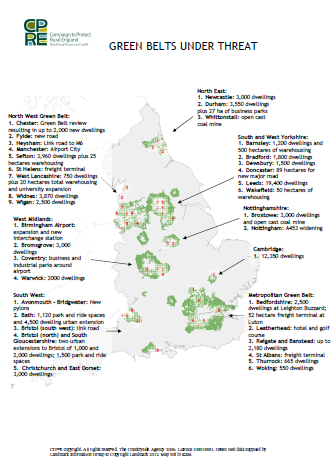 Is there a link between closed green belt data and attempts to open up the green belt for development? Probably not, but there might be a relationship between the two.